State and federal policies and programs are critical for a clean energy future, but as in politics, ultimately all energy and all change is local. Energy Districts provide an impactful and scale-able model for enabling change leadership and harnessing the “power of local” in every community and county in America. An Energy District is a local institution that leads, implements, and accelerates the locally-owned, inclusive, clean energy transition. In the process, Energy Districts create local jobs and retain and grow wealth (the green of energy prosperity), and simultaneously reduce carbon emissions and air pollution (the green of climate stewardship). Green meets Green. A win-win for everyone, and the right thing to do. Energy Districts are geographically and socioeconomically inclusive, independent, and nonpartisan. They create change through principal strategies of energy planning, market transformation, public engagement, advocacy, and readiness. As the flywheel of momentum builds, tipping points of energy efficiency and locally-owned renewable energy are crossed, community clean energy identity grows, and the transition becomes unstoppable. As of early 2019, there are four established Energy Districts in Iowa, and that many more in planning! Together with many partners, we are dedicated to building a network of Energy Districts across Iowa and beyond. We are working hard on enabling policies, funding opportunities and collaborations, and direct technical assistance to possible start-ups. If you’re interested in learning more and building an Energy District in your neck of the woods (or prairie), please contact us. 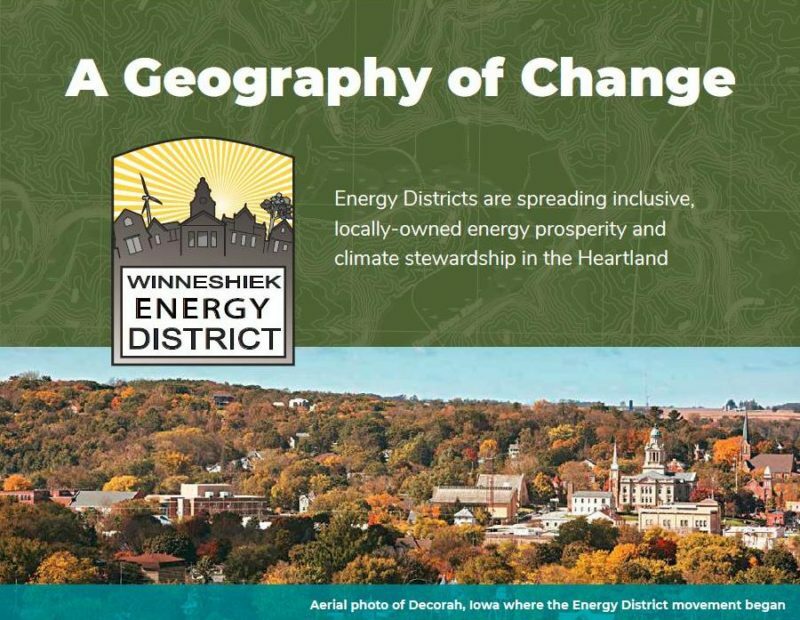 For more on the Energy District model, history, and opportunity, see our Geography of Change concept document pictured above. Additional writings about or coverage of the model are found in the links below. Further down you can find information on the Soil and Water Conservation District movement, which created the “universal local” change model, and provides a conceptual and time-tested foundation for “universal local” Energy Districts. An August 2016 op-ed in the Des Moines Register and Cedar Rapids Gazette, explaining the importance of locally-led institutions (including Energy Districts, Watershed Districts, and Soil and Water Conservation Districts) in flood prevention. Our April 2015 article in Iowa County Magazine, explaining the “Universal Local” concept and opportunity behind Energy Districts. Our July 2015 article in Iowa County Magazine, digging into solar energy opportunities for local government in Iowa. Our 2016, 2015, and 2014 brochures and summarizing our vision and achievements. The Energy District “universal local” model is based on the Soil and Water Conservation District (SWCD) model that grew out of the Dust Bown and Great Depression, and below we offer a few relevant links for those interested. SWCDs were founded on the realization that state and federal agencies needed local partners and local leadership to implement private lands conservation in every county in the country. The Roosevelt administration created model SWCD enabling legislation for states, and within 15 years almost every county in the country was covered. The SWCD model and standard enabling legislation was born in Washington and went nationwide. Might the Energy District model and enabling legislation be a similar transformational idea born in NE Iowa and spreading outward across the country?